we had a party last weekend – it was david’s birthday and we were in the mood for celebrating. we invited a few friends round and i knocked up some canapés. the goats cheese and rosemary mini muffins were on the menu, along with a gruyere, sage and onion version. so too were these mini thai-style mini turkey meatballs. they, and some mini thai-style sausage rolls were the hit of the night and i’d thoroughly recommend them if you’re planning a party and need some nibbles. not least as they were both able to be made in advance and put in the freezer until party day arrived. we also had some lovely cupcakes courtesy of crumbs and doilies. 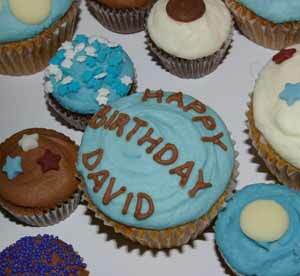 happy birthday david. place the sugar and fish sauce in a small pan and heat gently until the sugar dissolves. add the lemon grass, chilli and ginger, remove from the heat and leave to cool. stir this mixture into the turkey mince along with the finely chopped spring onions, corn flour and coriander. shape into walnut sized balls and place in the fridge to chill for 30 minutes (this helps the meatballs keep their shape while you are cooking them and makes them less likely to fall apart). heat a little vegetable oil in a shallow non-stick pan and gently fry the meatballs for c15 minutes until they are thoroughly cooked – the juices will run clear and there should be no trace of pink. drain on a piece of kitchen paper and serve garnished with the shredded spring onions (place them in a glass of iced water for 30 minutes so the onions curl up a little) and with the sweet chilli sauce on the side as a dip. if you want to freeze the meatballs, do so when they are cooked. allow them to defrost fully and reheat, wrapped in tin foil, in a hot oven for 30 minutes. mix the pork, spring onions, coriander, fish sauce and curry paste. leave to chill for at least an hour so the flavours have time to develop. roll the pastry out into a 30cm x 40cm rectangle. cut this in half lengthways and spread half the pork mince down the centre of each (i actually rolled the pastry slightly thinner and did 4 strips of pastry so my sausage rolls were barely an inch in size). brush the exposed pastry with beaten egg and roll the pastry around the filling, sealing carefully. brush the pastry with egg and sprinkle over the sesame seeds. cut the rolls into bite-sized pieces, using a serrated knife. arrange on a baking tray with the joins underneath and bake for 20-25 minutes until golden. serve warm with the thai dipping sauce. if you want to freeze the meatballs, don’t sprinkle with sesame seeds (they’ll fall off when frozen) but freeze the individual uncooked sausage rolls on a tray. you can bake these from frozen, just give them an extra 5 minutes. if you want the sesame seeds garnish, brush the frozen rolls with beaten egg and sprinkle the seeds on just before cooking. * i tore versions of these recipes from a magazine ages ago but have no idea which magazine and whose recipes they are so i can credit the creator accordingly. sorry. menu for hope - final day!